Liverpool recorded their first FA Cup win over Manchester United in 85 years with an impressive Anfield victory. Peter Crouch headed home Steve Finnan's cross after 19 minutes to give Rafael Benitez's side a deserved place in the quarter-finals. Edwin van der Sar had saved brilliantly from Harry Kewell seconds earlier as Liverpool dominated a poor United side. United's misery was compounded as substitute Alan Smith suffered a broken leg blocking a free-kick late on. Liverpool restored Pepe Reina in goal and Crouch up front - but United lost Rio Ferdinand when he failed a fitness test on a hamstring injury. United captain Gary Neville was inevitably jeered after his goal celebration in their victory over Liverpool at Old Trafford. 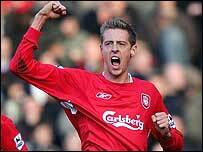 And he had a painful start when he was bundled over the touchline by Kewell inside three minutes. Liverpool's power dominated a lightweight United midfield in the first 45 minutes, but chances were at a premium. Van der Sar produced a brilliant save to stop Liverpool taking the lead after 18 minutes, turning Kewell's header around the post from Steven Gerrard's free-kick. It was the briefest of reprieves as Gerrard worked the resulting corner to Finnan, whose cross was met by Crouch. Van der Sar got a hand to the striker's header, but it trickled across the line via a post. Reina did not have a single moment of anxiety in the first-half, and Liverpool should have doubled their lead after 34 minutes when Finnan fired over an open goal from another dangerous Gerrard free-kick. Sir Alex Ferguson reacted to United's wretched display by sending on Louis Saha for Mikael Silvestre at the start of the second half. But Liverpool almost added to their advantage within seconds of the re-start, Wes Brown heading John Arne Riise's cross narrowly over his own bar. United finally posed their first threat after 52 minutes when Neville's cross almost caused confusion between Reina and Finnan, but the defender kept his composure to clear. Kewell squandered a great opportunity to give Liverpool a vital cushion when Gerrard's corner fell to the unmarked Australian in the area, but his shot was wayward. United lacked inspiration, but sparked briefly into life late on, Giggs shooting just over and Cristiano Ronaldo forcing Reina into a save low down. Smith had been sent on in a bid to get United an equaliser, but he was stretchered off with a broken leg and a dislocated ankle in the closing minutes. Liverpool were not troubled during seven minutes of injury time as they booked their spot in the last eight. "We deserved to win. We scored a goal and created more chances. You like to score more goals but sometimes one is enough. "I have said before that with our supporters behind us it is very difficult to beat us. "I am pleased for Peter Crouch because strikers need goals, but it was a good team performance. It was difficult to keep a clean sheet because they had four or five strikers on at the end. "There were a lot of long balls coming in, but at the end we didn't have a lot of problems in defence. "We have had three good games and three good results in a week when people were talking about how difficult it would be for us against the top teams." "You need an element of luck in the Cup and we didn't have it. "We lost Rio Ferdinand after training on Friday then Mikael Silvestre got a knock. "It has been 85 years since Liverpool beat us in the FA Cup and I was hoping it would be another 85 years, then I wouldn't be around to see it. "We found it hard to get our momentum going, but we stuck at it and I felt we dominated the second half. "We started the game badly, but Liverpool can play for five minutes and win a game. They have got height up front, get balls into the box and make it an aerial battle. "They are dangerous at set-pieces and maybe we just didn't have enough height in our team and their goal emphasised that." Liverpool: Reina, Finnan, Carragher, Hyypia, Riise, Gerrard, Hamann, Sissoko, Kewell (Kromkamp 82), Crouch (Cisse 88), Morientes (Luis Garcia 62). Subs Not Used: Dudek, Traore. Booked: Hamann, Hyypia, Carragher, Kewell. Goals: Crouch 19.Man Utd: Van der Sar, Neville, Brown, Vidic, Silvestre (Saha 45), Ronaldo, Fletcher (Smith 76), Giggs, Richardson, Rooney, van Nistelrooy, Smith (Park 90). Subs Not Used: Howard, Pique.